Contact Terahertz Technologies for further details or to request a quote. Applications for these Word-Width Digital Fiber Optic Links include data acquisition for plasma physics experiments, signal transmission and control of equipment at high voltage potentials, operation through Faraday shields, and precise noise-free signal transmission in hostile EMI environments. The Word-Width Digital Fiber Optic Links LTX-5520 conveys sixteen independent channels of digital information over a fiber optic link ranging from meters to more than 10 kilometers. Each of the 16 incoming TTL channels is sampled at 5 x 107 times per second, multiplexed and transmitted serially over an optical fiber at one gigabit per second. The receiver acquires this digital data and de-multiplexes it to 16 separate output ports. Each of these channels may be toggled at rates ranging from 0 - 25 Mb/S. Two models of the Word-Width Digital Fiber Optic Links are available. Selection depends on the fiber type and the length of the fiber optic link that is required. The LTX-5520-850 transmits at 850 nM over multimode fiber optic links of up to 500 meters in length, while the LTX-5520-1310 transmits at 1310 nm over single-mode fiber to span distances exceeding 10 kilometers. The LTX-5510 precision analog fiber optic link was the first in our series of "Signal Transporters". It digitizes an analog signal at a 50 Ms/S rate with 12-bit precision and reconstructs the signal at the LTX-5510 receiver by means of a fast D/A converter. 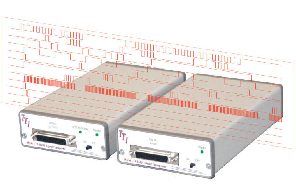 If the user employs the LTX-5520 receiver with the LTX-5510 transmitter, the result is a remote fiber-coupled 12-bit data acquisition system. Similarly one can employ the LTX-5520 transmitter with the LTX-5510 receiver to generate fast high-resolution analog signals at a remote location.